Hernando de Soto was born in 1496 in Extremadura, Spain. He grew up poor. Because of this, Hernando de Soto dreamed of glory and wealth by finding new lands in the west. In 1514, he went with the first Governor of Panama to the New World. He had many of the skills necessary to help with the conquest of Central America. These skills caused him to gain a lot of fame and recognition that led to him helping with the conquest of Peru. After becoming a member of the council in Leon, Nicaragua, de Soto led an expedition in the Yucatan Peninsula in 1530. During this trip he was to find a passage between the Pacific and Atlanta Oceans that would make trade with the Orient easier. Unfortunately de Soto did not find what he was looking for, which led him to leave his life in Nicaragua for good. From here he took his men to the base of Francisco Pizarro. Pizarro named him captain, and soon after that he had de Soto set up a meeting with Atahualpa and his people who lived in the area. Their men then attacked the inhabitant’s tents and held Atahualpa captive for several months. They received ransom for Atahualpa in the form of gold and silver. It was then that they heard that an Incan army was moving in. Pizarro gave orders to de Soto for him to go look for the army, and when he left he killed Atahualpa so he could not be saved by his people. De Soto came back to the base to let Pazarro know he did not find any army. De Soto was angry that Pazarro killed Atahualpa as he had made friends with him during his time captive. From here the men headed to conquer Cuzco. Pizarro’s brother and de Soto went before Pizarro with 40 other men and battled the Incan successfully. In Cuzco the men found gold, silver and many other treasures that made them rich. Eventually de Soto was made lieutenant governor of Cuzco while the capital was being rebuilt. After being denied to be the second in command to the governor, he left the area with his treasure and headed to Spain. After returning to Spain, de Soto was given governorship of Cuba by King Charles and he married Isabel de Bobadilla. He commissioned 620 volunteers to go with him to Cuba and on an expedition of North America. With him he brought livestock, horses and armor along with equipment they would need. Although the exact route the de Soto took has been argued by historians, it’s believed that the first stop made was in Florida in 1539. In 1540 they went to Georgia and then North Carolina. After a month in the Appalachian Mountains, they headed to Tennessee and then Alabama or Georgia. The next area they landed in was Mississippi. They stayed there for an entire winter. In 1541 they went through the Mississippi River to the Arkansas River. After going into Arkansas they headed back to the Mississippi River once again. 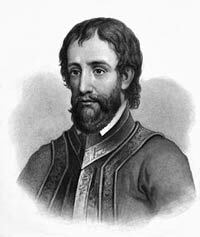 On May 21, 1542, de Soto passed away due to semitropical fever. He died in a village located in Arkansas or Louisiana named Guachoya.